If you've thought about investing, you've undoubtedly considered stocks. And for good reason: During the period of 1928—2015, the Standard & Poor's 500 index averaged an annual return of 11.25%. But getting started can be confusing, and even making sense of stock tables and the information in all the columns can be daunting. 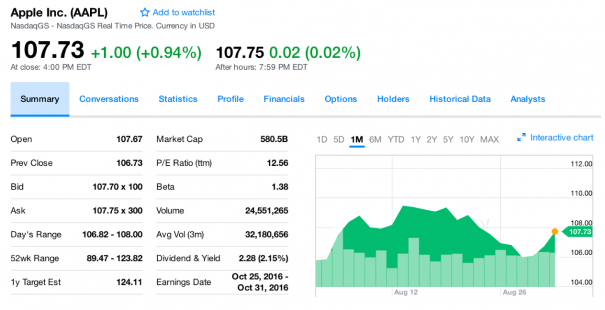 Given that Apple Inc. [Nasdaq: AAPL] is currently the publicly-traded company with the largest market capitalization, at some point you'll probably want to learn more about its stock price. First, take note of the market in which the public company trades, since it'll yield important clues about the stock. For example, Apple trades in the NASDAQ, which is an electronic marketplace for buying and selling securities mostly in the U.S. technology sector. On the other hand, more traditional companies like General Electric Company, Wal-Mart Stores, Inc., and Target Corporation trade on the New York Stock Exchange (NYSE). And keep an eye out for stocks traded on foreign exchanges. Some investment accounts may limit you to only stocks traded on U.S.-based exchanges or charge you high fees to invest in foreign stocks. Let's break down the meaning of these numbers. On the left side of the summary table of our example, you'll find a list of key measures of the stock price. Let's review these measures, starting from the top. This the price at which a stock first trades upon the opening of an exchange on a given trading day. Both Nasdaq and the NYSE open at 9:30 a.m. Eastern Standard Time. The previous close is the final price at which a security is traded on a given trading day. If the opening price is dramatically different from the previous closing price, you have a signal that investors reacted to an important piece of news, such as an earnings call, industry regulation, or a downgrade or upgrade from an investment firm. The bid is the price in the market to buy a stock, while the ask is the price a seller in the market is willing to accept. The difference between the bid and ask price is a measure (referred to as "spread") of the demand and supply for stock. The smaller the spread, the easier and faster is to conduct a sale or purchase of a stock. Given a bid-ask spread of just $0.05, your transaction order for Apple stock would be cleared quickly. The number following the bid or ask price represent the number of pending trades in lots of 100 at the given bid and ask price. In this example, there were 10,000 pending purchase orders at $107.70 per share and 30,000 pending sale orders at $107.75 shares. Any pending orders that aren't processed on the same trading day are carried on to the next one. These figures provide an idea of the volatility of a stock price. While the 52-week range gives you the minimum and maximum price of Apple stock during a trailing 52-week period, the day's range gives you the same values for the most current trading day. In our example, Apple stock is currently trading below its 52-week high. 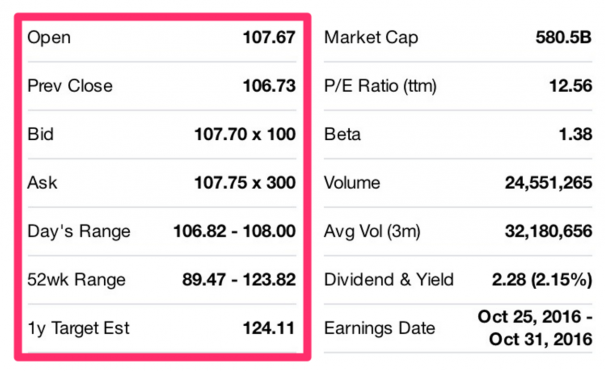 Given that the consensus among analysts is that the one-year target estimate price of Apple stock is $124.11, the price of Apple stock appears to have upside potential (it's price will go up). Keep in mind that this is just a consensus of estimates, meaning that different analysts may have different targets and that all of these numbers are just predictions. In the stock market, anything can happen! Paying attention to the price volatility of any stock's price is important to put those ups and downs in context. Now let's take a look at the right side of this stock table. The next set of measures are a bit more advanced, but they are also useful even to the newbie investor. Also referred to as "market cap," this is the total dollar market value of a company's outstanding shares. This value changes constantly and is often used to rank the size of publicly-traded companies. On this date, Apple stock still held onto the number one spot on the list of companies ranked by market capitalization. P/E ratio is short for price-earnings ratio and is calculated by dividing a stock's current share price by its earnings per share (EPS) for the last trailing 12 months (TTM). 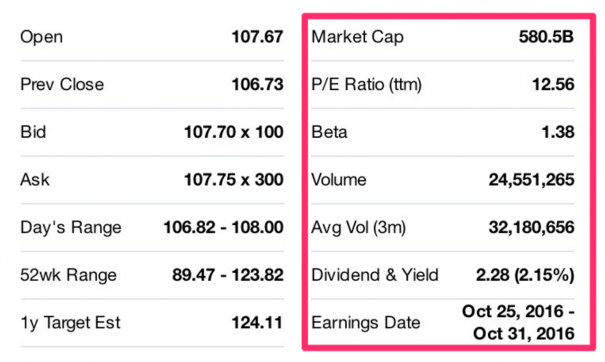 The P/E ratio provides you a guide as to how much you can expect to invest in a company in order to receive one dollar of that company's earnings. In our example, you can expect to pay $12.56 to get a $1 in return for investing in Apple. By following the investing maxim "buy low and sell high," you would want to buy stocks when P/E ratios are low and sell when P/E ratios are high. Still, there are stocks with low P/E ratios that have tanked even more and stocks with high P/E ratios that have turned out to be great investments. This is a measure of volatility of the stock price compared to that of the market. The market has a beta of 1.0, so stocks with a beta below that benchmark move less than the market and stocks with a beta above that benchmark move more than the market. Given the beta of 1.38, the price of Apple stock fluctuates a bit more than that of the market, meaning that you can't expect wild fluctuations. If the market were to tick up a bit, you would expect this stock to tick up just a bit more, and vice-versa. Generally, investors with very low tolerance to risk avoid stocks with high beta. Otherwise, those investors could end up with too many sleepless nights. The volume tracks the total number of transactions for the stock for a trading day. The average volume tracks the average number of transactions per day within a specified period, such as three months in this example. A high trading volume indicates that a stock is very liquid (transactions clear quickly). The dividend indicates the annual dividend payment per share and its yield indicates the percentage return on the dividend (annual dividends per share divided by price per share). When the stock table provides no dividend and yield numbers, the company doesn't currently pay out dividends. This is the date on which you can expect the company to release an official public statement of a company's profitability for a specific time period, typically a quarter (Form 10-Q) or a year (Form 10-K). Expect analysts to release their own estimates of those numbers close to that date and correct those estimates shortly after the official statement from the publicly traded company. Depending on the nature of the announcements made on an earnings date, you can expect a small or big reaction from the stock market and a reflection of that reaction in the price of a stock. To buy or sell a stock, always check against your holding period, tolerance to risk, target investment fee for a period, and overall retirement strategy.